Mecca has changed a lot! Its true... now u can see construction projects here and there.. the big ones of course... So no wonder the environment around Masjidil Haram is polluted and dusty! you can see people wearing Protection Masks almost everywhere! I forgot to bring one and as a result of my carelessness.. I'm now having a bad cough and soar throat.. aiyark!! 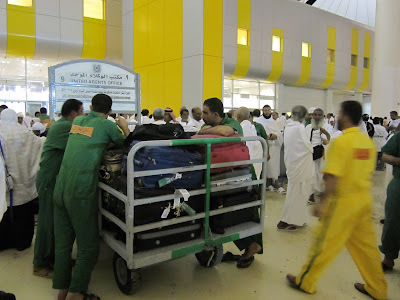 But one thing is still the same... there are soo many people inside Masjidil Haram during Hajj season. Especially on the Kaabah Square where thousands of people perform their Tawaf Ibadah. 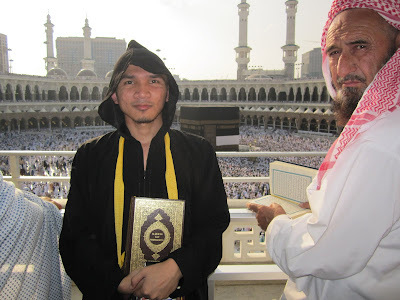 I was scared every time I performed the Tawaf.. there u can see people arguing, fighting, praying, crying, etc. Any careless mistake might lead to a big problem. 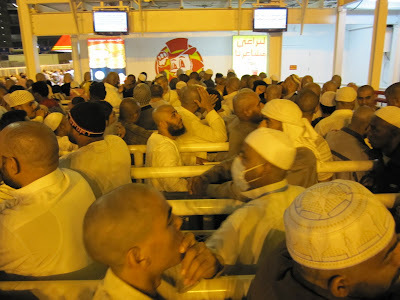 I was told there were about 2.5 millions muslim scattered around the city of Mecca during my stay there. Just imagine how 2 mil of people.. inside one big mosque... praying! FuhH!! SubhanAllah.. Here.. 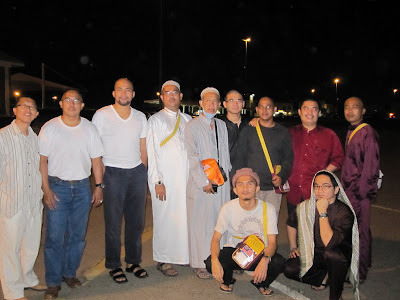 I got the chance to meet muslims from around the world! just name it, Pakistan, India, Iraq, Greece, USA, French and even China! I even got the chance to change numbers and contacts.. 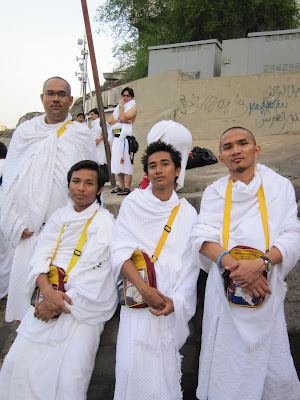 It was a great Hajj trip since I got the chance to perform my Ibadah happily. Eventhough we can't go to the mosque every prayer time, we're still happy. The weather was quite bad at some time and it was raining heavily one day before Wukuf Day. Oh my.. that's what u dont see in Mecca. I heard that a lot of people died during that day and it was flooded badly in Arafah. That was the worst Rain Mecca has ever experienced in 27 years!!!! SubhanAllah. 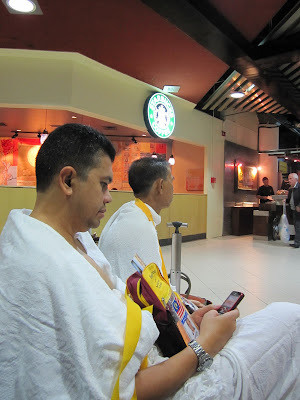 Completed Our Final Stage of Hajj... The Jamarat. Some familiar faces were there in Mecca. I got the chance to meet Dato' Emran, Ustaz Dasuki, Ir Siti Hawa and Ir Bahardin, Zulhilmi Zainol's parents and many more. We even took some photos wit the current Sports Minister, Dato' Seri Shaberry Cheek. He was a really nice person. That's the beauty of Hajj.. we meet people from every where.. regardless of who you are.. what status u hold, which position, royals, etc.. u are there, gathered in one place... praying and worshipping the one and only God. 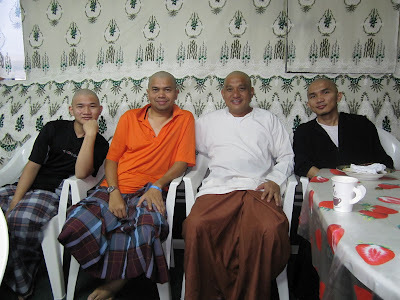 I learnt a lot from the people there, especiallu Ustaz Mohamad. He taught us a lot of things. And again, it was my best Holy Land trip ever! :-) may all of us get our rewards from the Almighty Allah. 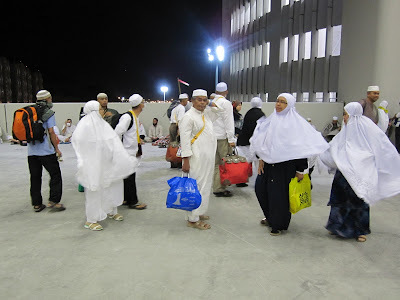 Hajj Mabaruran insya Allah.